Executed in 1967. This work is number two from an edition of five and is accompanied by a certificate of authenticity signed by the artist. Los Angeles, The Museum of Contemporary Art; Washington D.C., The Corcoran Gallery of Art; capc Musée d'art Contemporain de Bordeaux; and Otterlo, Rijksmuseum Kröller-Müller, 'monuments' for V. Tatlin from Dan Flavin, 1964-1983, April 1984-January 1986, pl.46 (illustrated; another example exhibited). 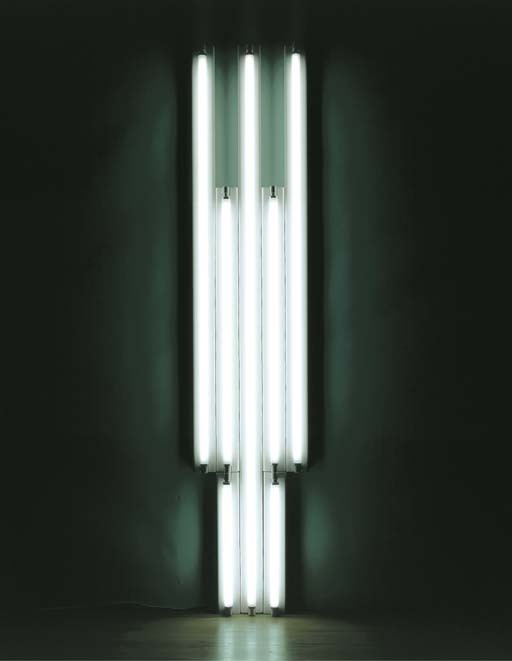 Chicago, Donald Young Gallery, 'monuments' for V. Tatlin from Dan Flavin, 1964-1982, for the Museum of Contemporary Art, Los Angeles in collaboration with the Leo Castelli Gallery, New York, 1989, pl.46 (illustrated; another example exhibited). "Regard the light and you are fascinated--inhibited from grasping its limits." (D. Flavin and B. Smith, Dan Flavin, fluorescent light, etc. from Dan Flavin, Ottawa 1969, pp.18-19). Flavin treated light itself as a material in his pioneering use of industrial fluorescent fixtures in art. His works create complex, subtle relationships between light and space that activate the architecture in his installations, or 'situations,' as he preferred to call them. The cool white light and striking geometric composition of "monument" for V. Tatlin exemplifies the simplicity and elegance of Flavin's luminous creations. This work belongs to the most important series in Flavin's career. The series involves permutations in the arrangement of white fluorescent light tubes of the standard lengths (two-foot, four-foot, six-foot, and eight-foot) and varieties of white (daylight, cool white, and warm white) available commercially. These "monuments" are titled in homage to the Russian constructivist artist-designer Vladimir Tatlin who embraced industry and believed in the continuum of art and life. Tatlin's motto, "Real materials in real space," applies fittingly to Flavin's inventive use of commercially available industrial materials. Flavin intended some irony and tragic humor in the title of his "monuments" for V. Tatlin. They are not monuments in the traditional sense, in that their medium is somewhat incorporeal and transient. He said, "I always use 'monuments' in quotes to emphasize the ironic humor of temporary monuments. These 'monuments' only survive as long as the light system is useful (2,100 hours)." (S. Munchnic, "Flavin Exhibit: His Artistry Comes to Light", Los Angeles Times, April 23, 1984). The title also references Vladimir Tatlin's spiraling architectural work Monument to the Third International, designed in 1919, which was never built. The irony of a monument which lives on as an idea but does not stand as a permanent physical form is akin to the irony that Flavin's "monuments" have a limited lifespan. (R. Koshalek, Dan Flavin: installations in fluorescent light 1972-1975, Fort Worth 1997, p.3).